Chinese Manufacturing Map: what's made where in China? Made in China – but where in China? With the biggest population and the fourth largest land-mass of any country in the world, it’s hardly surprising that China has become the world’s factory. Yet if you want something specific, where in China should you start looking? What’s immediately noticeable is how the Chinese manufacturing industry has grown up along the eastern coast of the country, with easy access to markets, shipping and other logistics. 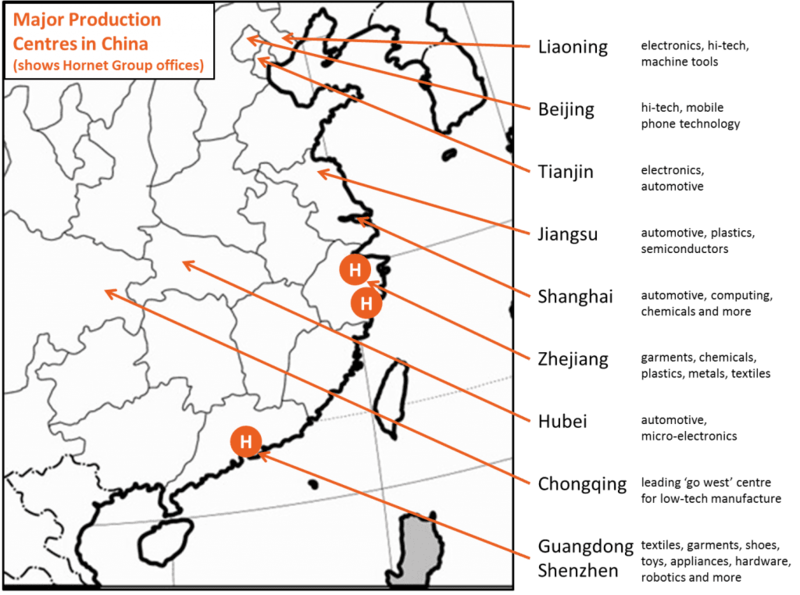 Beijing, Shanghai and Guangdong act as manufacturing centres along this coastal belt. Hornet has based its China offices in these coastal provinces too. Our offices are within a day’s travel of Shanghai and Guangzhou (Canton), so we are close to major manufacturing hubs. Guangdong is worthy of special mention. It’s home to the city of Guangzhou (formerly Canton) as well as Shenzhen, China’s first Special Economic Zone. It’s also right next to Hong Kong. Guangdong has more foreign investment than any other province in China and accounts for a third of China’s trade. Take a closer look at the industries listed for this province, though. They range from light manufacturing and low-skilled labour-intensive sectors right through to hi-tech areas like robotics. Guangdong reflects how Chinese manufacturing is changing as wages and capabilities increase. (See this earlier post.) There are even start-up accelerators like Haxlr8r in Shenzhen, developing the industries of the future. This part of China has come a long way from the garment sweatshops of public perception! Meanwhile, factories using unskilled labour are moving within China. There’s a trend to ‘go west’ – which in China means inland. Export supply chains are longer, but as the domestic market grows this will matter less. Also, costs of manufacturing are lower. Workers are often happy to be closer to their families too. Many Chinese manufacturing companies still keep a presence in Guangdong or Shanghai to maintain customer contact, even as they shift operations west. If it is, congratulations. You’ve taken one step to narrow down your supplier search. Only a few thousand left to choose from! Here’s how we go about choosing the best possible supplier for our clients. If you can’t see your product and you don’t know where to start, contact Hornet and let’s see if we can help.